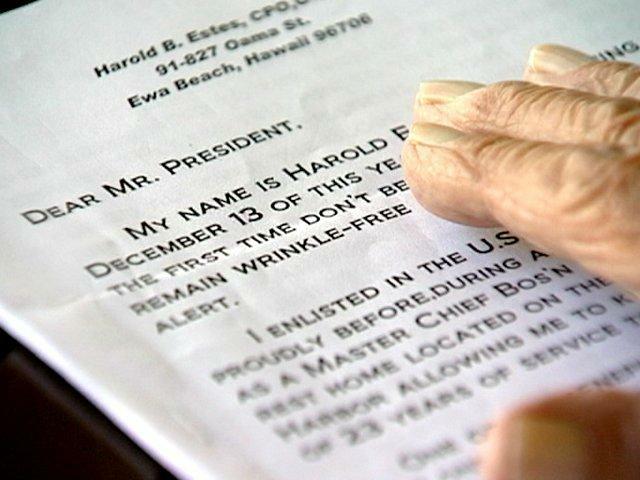 The author of the letter was Hawaii resident Harold B. Estes, a long-serving veteran of the U.S. Navy who was pictured in the May 2005 issue of Fore ‘n Aft magazine and for whom the BMC Harold Estes Leadership Award is named. A letter from a 95-year-old retired World War II sailor in Hawaii to President Barack Obama has stirred up attention on the Internet. Retired ship’s Boatswain Harold Estes wrote the letter and someone in Florida sent it to Congress.org. The letter then bounced around different sites and people questioned whether it was real. Estes said he was unaware of the controversy he caused on the Internet. “I’ve never looked at anything on the Internet. I don’t follow this. I didn’t write this to get publicity,” Estes said. After 9/11 you said, “America hasn’t lived up to her ideals.” Which ones did you mean? Take a little advice from a very old geezer,young man. Shape up and start acting like an American. If you don’t, I’ll do what I can to see you get shipped out of that fancy rental on Pennsylvania Avenue. You were elected to lead not to bow, apologize and kiss the hands of murderers and corrupt leaders who still treat their people like slaves. 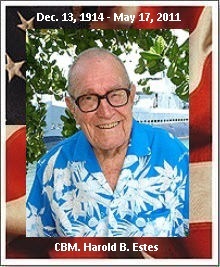 Harold B. Estes passed away at the age of 96 in May 2011 and was interred at the National Memorial Cemetery of the Pacific. Let’s not let his wishes be ignored. Let’s make sure we support those who wish to make America great again! Visit the Harold B. Estes Facebook Page !